Today’s post was written by Lawrence Chiu, senior product marketing manager on the Office 365 team. When you log in to the app, the new dashboard, featuring four Notification Tiles, is displayed. 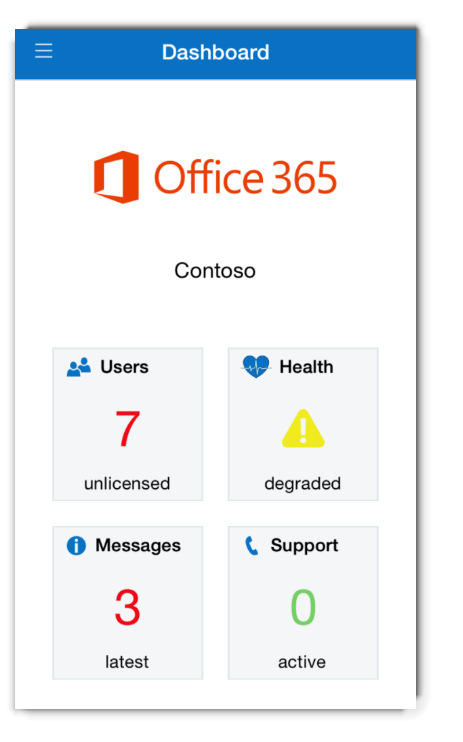 You can quickly see useful information about your Office 365 environment including: number of users who don’t have Office 365 licenses, the current health of your service, number of recent messages and number of active service requests. 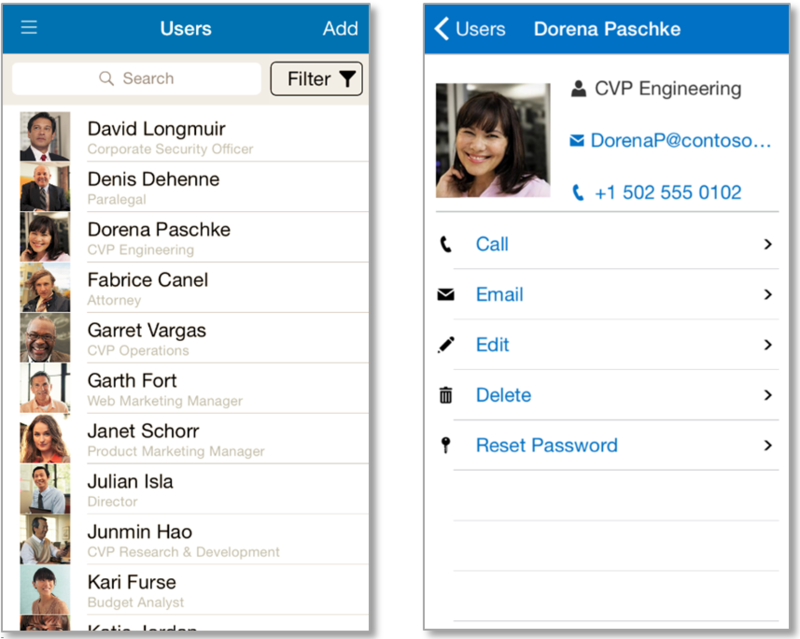 User management has been added, giving the ability to view your users and administer user-rights directly from your mobile device. You can also add, edit and delete users as well as reset their passwords and assign licenses. 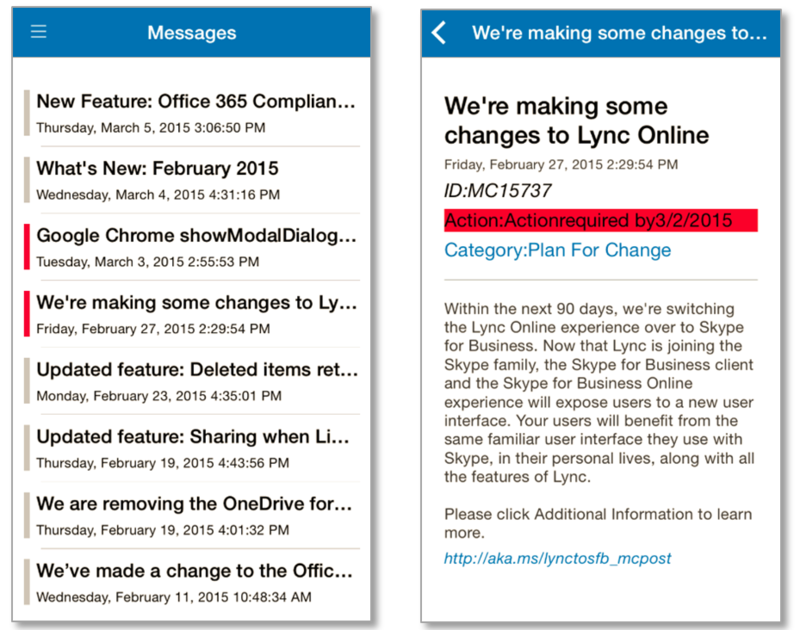 Also new in the Office 365 Admin app is the Message Center. Similar to how it works in the Office 365 Admin Center, you receive messages that inform you of changes coming to the service, tasks you need to do to keep the service running smoothly and new features coming to the service. Lastly, the service health view has been simplified so you can quickly get the status of the service right from the dashboard. 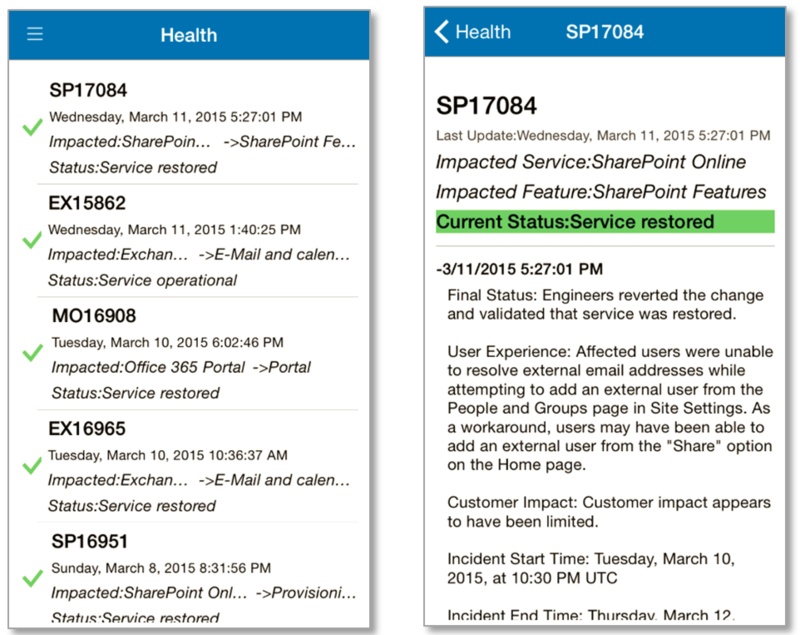 In the event that there is a potential service incident, you can get more details by tapping on the Health Tile where you will be taken to the latest service incident messages. 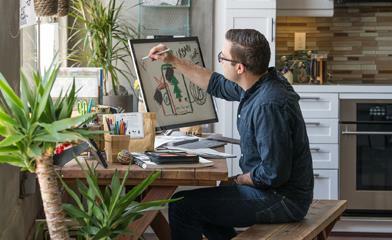 Those are just some of the new capabilities available in the Office 365 Admin app. Stay tuned for more and please let us know your thoughts by contacting us at feedback365@microsoft.com. Please note that you need Office 365 administrator credentials to use the app. For iOS 7+, download the app from the Apple App Store. For those with the previous version of the Office 365 Admin app, your app should update automatically. Q. What languages is the app available in currently? A. The app is available in English, Brazilian Portuguese, French, German, Japanese, Spanish and Traditional Chinese. Q. Does this app support multi-factor authentication? Q. In addition to multi-factor authentication, is there another way to secure access to the app? A. Yes. The app provides you with the ability to assign a 4-digit PIN code. When enabled, you are required to enter the 4-digit PIN code every time you start the app. This is a great way to secure your Office 365 app if your browser saves your password. Q. How do I interpret the status of the notification on the Health Tile? A. The Health Tile notification indicates the collective status of all your Office 365 services. When the status is green, it means the service is operating normally. If the status turns yellow, it means there is a potential service incident occurring. When the status is red, it means that there is a service interruption.